1870 4d Vermilion, SG 94, Plate 11, and 6d Mauve, SG 109, Plate 8, tied to cover to France by a very fine N.W.R.P. OFFICE/LIVERPOOL 466 duplex Nortth West Railway Post Office, Wilson 195. 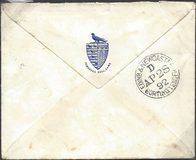 1864 Envelope addressed to Kings Cross showing on the reverse a fine NORTH.W.Ry. "Mail Guard" handstamp in Red. 1861 1d Rose-Red, SG 40, tied to envelope from East Grinstead to Inverness showing on the front a very fine Caldenonian Railway with small 'CR' in Red, W 634. 1866 1d Rolse-Red, SG 43, Plate 84 tied to envelope from Yarmouth, Norfolk, addressed to Lockerbie showing on the front a very fine Caledonian Railway 'C.R/P.O' in circle in Red, W 645. 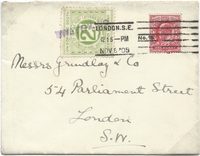 1928 Envelope to Glasgow franked by 3 x ½d, SG 418, tied by very fine GALLOWAY SORTING CARRIAGE cds, Index 'U', W 770. 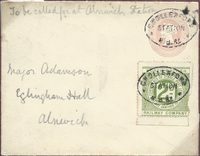 1934 George V 1d Carmine Postcard addressed to Worsley, nr Manchester franked by a ½d Green, SG 418, both tied by superb EAST ANGLIAN T.P.O. DOWN (KINGS LYNN SECTION), Index *, W 563a. 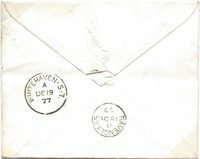 1877 Envelope from Carnforth to Whitehaven shjowing on the reverse a superb 'WHITEHAVEN - S - T.' Sorting Tender, W 160. 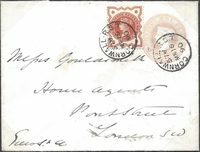 1895 1d Lilac, SG 172 and ½d Vermilion, SG 197, tied to envelope to London by very fine LIVERPOOL & LONDON T.P.O. circular datestamps, Wilson 201. VERY SCARCE - RARE ON COVER. 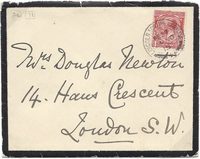 1872 Envelope to Harrogate redirected to Wetherby, franked by a 1d Rose-Red, SG 43, Plate 144, and tied by a fine A/HULL - ST/JY19/72/383 duplex SORTING TENDER, W 272. Scarce. 1845 Cover from Bristol to "Ballymurlagh near Arklow", Ireland, showing a very fine circular M/NR in red. 1867 1d Rose-Red, SG 43, Plate 100 x SIX tied to cover addressed to Bordeaux "per early Mail" by a fine N.W.R.P. OFFICE/LIVERPOOL '466' duplex, W 195.